The pressure of the millions of Syrian refugees now residing in Lebanon is creating a dire situation, Lebanese Prime Minister Saad Hariri said on Wednesday. 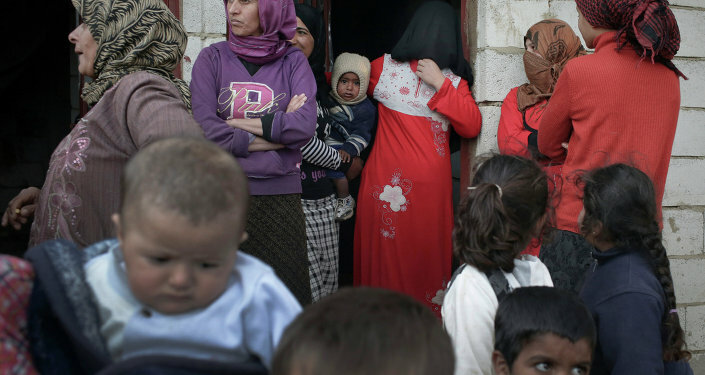 WASHINGTON (Sputnik) — According to the UN Refugee Agency, there are slightly more than a million registered Syrian refugees in Lebanon, which amounts to about 30 percent of Lebanon's total population. "We have recently witnessed signs of fatigue within the host communities as tensions with the Syrian displaced are rising. The situation, frankly, is a ticking time bomb," Hariri said at an event in Washington, DC. Lebanon’s schools are now educating more Syrian children than Lebanese, Hariri added. Around 230,000 Syrian and 200,000 Lebanese children are now enrolled in the country’s schools. However, another 200,000 displaced Syrian children in Lebanon are not in school at all, which Hariri said creates a real danger for the children, both Syrian and Lebanese. The prime minister pointed out that Lebanon's schools, hospitals, electric grid and other public services are also overwhelmed. Hariri also said the Lebanese government has outlined a strategy to deal with the crisis, would coordinate with the United Nations and other agencies and would not force Syrians to return to Syria. However, Hariri acknowledged that social tensions are rising between the Syrian refugee population and Lebanese citizens, but said this problem could be resolved by spurring economic growth. "Because we have 1 percent growth, we cannot accommodate refugees the way we'd like, because they're taking the jobs of Lebanese," Hariri said. The prime minister explained the Lebanese government's strategy is to encourage the United States, World Bank and International Monetary Fund to contribute to Lebanon's capital investment plan by offering grants and concessional loans to the country. He noted the government hopes to attract $12-14 billion for its capital investment plan over the next five years, an amount that he said would resolve the problems posed by the influx of refugees. Such investments would jump-start the Lebanese economy and spur job creation, alleviating many of the social tensions in the country, Hariri said. "The end solution, however, would be for Syrian refugees to return to their home country as "Lebanon cannot live with 1.5 million refugees until the end of time." At present, Lebanon's state-run electricity company imposes rolling electricity blackouts, with parts of the country receiving power only a few hours a day. The country also frequently faces severe shortages of water, and officials have struggled to find solutions for the disposal of increasing amounts of waste.